NIN’s Creative Commons licensed Ghosts I-IV has been making lots of headlines these days. First, there’s the critical acclaim and two Grammy nominations, which testify to the work’s strength as a musical piece. But what has got us really excited is how well the album has done with music fans. Aside from generating over $1.6 million in revenue for NIN in its first week, and hitting #1 on Billboard’s Electronic charts, Last.fm has the album ranked as the 4th-most-listened to album of the year, with over 5,222,525 scrobbles. 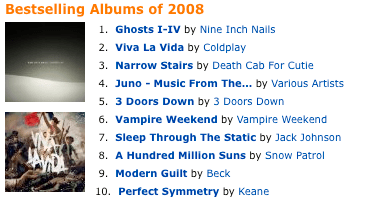 Even more exciting, however, is that Ghosts I-IV is ranked the best selling MP3 album of 2008 on Amazon’s MP3 store. The next time someone tries to convince you that releasing music under CC will cannibalize digital sales, remember that Ghosts I-IV broke that rule, and point them here. Repost from “NIN’s CC-Licensed Best-Selling MP3 Album” by Fred Benenson, available under a Creative Commons Attribution 3.0 Unported License.